On Wednesday August 14 the preliminary ideas for changes to the GREAT Bus Routes, which are a result of the on-going Short Range Transit Plan (SRTP) Study, will be available for public review and comment. Starting at 9 a.m. the GREAT bus routing options will be displayed at the Leslie Building on thePitt Community College Campus in Winterville. The presentation boards will also be on display in the Goess Student Center for review and comment through the lunch hour. SRTP survey results: College students support evening service, amenities, and better frequency. Starting at 2 p.m., the same display will be set up in the Sheppard Memorial Public Library at 530 Evans Street in downtown Greenville, NC. The preliminary ideas for changes to the GREAT Bus Routes will be available for public review and comment until 6 p.m.
We encourage everyone to attend one of these sessions to share their options. If you have special transportation needs, need a translator, or are visually or hearing impaired; arrangements can be made to assist you. Please contact the GREAT administrative offices at 252-329-4532 or visit the Public Works Transit Division at www.greenvillenc.gov at least 24 hours in advance of the open house session to request any special assistance. A GREAT way to get around. Outreach – besides the steering committee and stakeholder interviews the Study will hold at least two neighborhood meetings for additional outreach from people who might need alternative means to participate in the planning process. Ideally at least one meeting that is likely to attract the Latino/Spanish speaking population and another that hears ideas from the minority population (about 80% of the current ridership is African-American). There will also be two public open houses – one of which may be on National Night Out in August. The consultant will work with Agency Stakeholders at the upcoming Locally Coordinated Human Service/Public Transportation Planning meeting being conducted by the Mid-East Commission, on June 5 in Washington, NC. The outputs of the Locally Coordinated Planning document must state specific unmet needs of the elderly population and/or persons with disabilities who live in the City of Greenville in order to be eligible for targeted Federal Transit Administration funds. Opportunity to participate – the entire five year planning process in designed to be interactive and we encourage you to participate. You can post your comments on this blog page and receive a string of on-going dialogue or you can even mail the Project Manager, Bill Barlow at wbarlow@stantec.com and hold a private conversation. We are also posting a calendar of events so you can follow the process in person. Then event calendar will be updated as dates become firm, so please check back often. A total of 553 on-board surveys were collected in the first week of May and those results are now being analyzed to learn more about people who depend on the bus to get around. At first glance we discovered that people need dependable on time performance to get to class and work on-time. PCC is the biggest single destination and that people need the bus to get to work. 46% of the 553 surveys indicate a transfer was necessary to reach the riders final destination. 58% of today’s riders have no car in their household, to use for their trip. Pitt Area Transit System will administer a separate on-board survey that is designed to gauge satisfaction of the “complementary paratransit” service the County provides to GREAT under a contract arrangement. On-line surveys are being posted to the website to learn more about people who do not ride the bus and how they can be encouraged to become riders. Regionalization discussions should focus on coordination as opposed to consolidation, i.e. bus transfer locations and synchronized timing. Pitt Community College is a prime user of the GREAT services. Currently about 5% of the PCC 9,000 credit course students ride GREAT to campus. The college pays about $9,000 per year for the service. The College wants to explore how to fund more hours of service. GREAT’s annual support from the Federal Transit Administration is about $1.6 million and the State supplies about $285,000 in grants; while the City will need to supply $521, 682 to meet the expected $2.4 million 2014 expenses. The baseline budget is expected to stay relatively flat over the next five year period. There is a $2.5 million grant that is dedicated to the intermodal center project. The NC Legislators called for a 3% reduction in transit funding that may impacts GREAT’s operating funds that come from the State in 2014. Current loop routing has some redundancy that should be analyzed (i.e. 5TH Street). This should be done with respect to other areas vying for expanded services, i.e. recent changes for new Wal-Mart service. Bigger pass discounts for multiple rides should be considered. More bus stops, waiting pads and shelters (both sides Wal-Mart and Hosp. plus Golden Coral, new stops along Greenville Blvd., Willabee Park, Hwy 43). A couple of ADA infractions were noticed - announcements were not made at all major stops and wheelchair ramps extended beyond the sidewalk where there was no pad for offloading, e.g. wheelchairs ended up maneuvering in the grass. Safety did not appear to be a big concern. Drivers were generally observed to be courteous and helpful. GREAT has a healthy 19% ratio of cost recovery coming from fare collection. The “College Prowler” was also consulted because of the importance of ECU to the City of Greenville. Most Universities about the size of ECU tended to rank low in perceived safety on campus and in town - if students are nervous on campus and in town they may also be reluctant to use the City Bus. Availability of shopping was ranked lower by ECU students than any of the other 4 campuses they were compared to, while variety of off campus dining ranked very high and Greenville was considered one of the most affordable towns for off-campus housing (68 out of 1,500 schools). Parking on and off campus was ranked “limited”; this creates a positive transit atmosphere. Transit was given a solid “B” for availability, with very few ECU students using GREAT – this “B” must be assumed to be for ECU bus service. There does appear to be some GREAT market opportunities with students that should be explored. 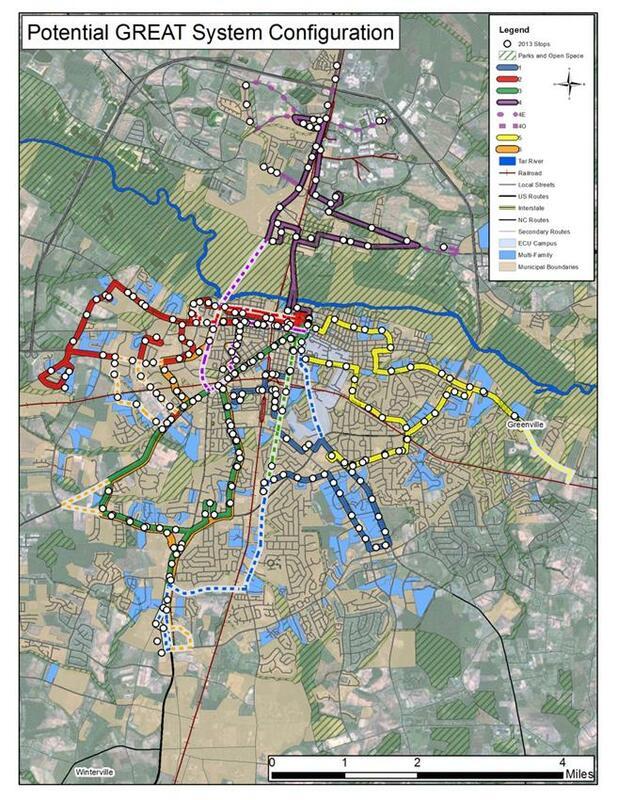 Greenville Area Transit Short Range Transit Planning. © GREAT Transit. City of Greenville, NC. Simple theme. Powered by Blogger.